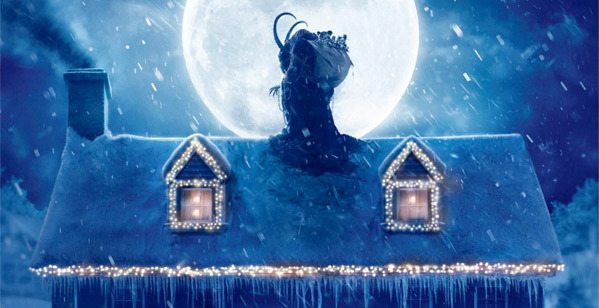 Sound Off: Mike Dougherty's 'Krampus' - So What Did You Think? Now that you've seen it, what did you think? You don't want to be on his list. Now playing in theaters everywhere is Krampus, the new horror comedy mashup from Mike Dougherty, the director of Trick 'r Treat. This time he introduces us to the Krampus myth, with a story about the big, nasty Christmas beast and his friends who come torment a small town. Think Gremlins meets Christmas Vacation. Starring Adam Scott, Toni Collette, David Koechner, Allison Tolman, with Emjay Anthony as Max. So how is it? Will it become your new Christmas viewing tradition? The best horror comedy since Trick 'r Treat, or is it really awful? Once you've seen it, post a comment below with your thoughts on Mike Dougherty's Krampus. To throws some more logs on the fire, I thought Krampus was awesome. It's not perfect, I wanted more, but I thoroughly enjoyed the movie. I think it has a very smart script with a bevy of interesting characters - right down to the way the Christmas Vacation-esque relatives who show up are contemporized from rednecks to gun-lovin' conservatives. But those guns do come in handy. It's goofy, and fun, and then it gets really freaky. I admire that so much of the horror was done practically, but this is where I wish they had more of a budget to do more with these kind of creatures. It felt like the world outside of the home could've been bigger, but they didn't have the budget to do much more than what we do see, so most of the action is fairly contained. That said, I still think it's a great Christmas horror movie. It really does have that kind of Amblin vibe, even in the script and the way it provides some refreshing changes to the usual tropes that always have to show up in horror movies. It's a good twist on what is usually expected for this kind of holiday comedy, and it's all handled with care, because Dougherty knows what he is doing. The creepiest part was the Jack-in-the-box guy, just frickin' crazy. I do wish the Krampus monster was more detailed and animate, but it didn't bother me too much, I still enjoyed seeing the story unfold. Highly recommend this film to anyone curious about it. So what did you think of Mike Dougherty's Krampus? Christmas horror success, or disaster? Good review Alex! I loved this movie so much. Felt like a mix of Christmas Vacation meets Gremlins. Definitely going to be a cult-classic I bet. Good review Alex, and good to see that Krampus found an audience of some people who enjoyed it. However, while really wanting to like this movie, except for a couple of moments, it was a disappointment for me. The opening credit sequence was a great setup, being quite humorous and socially relevant, but beyond that, most of this movie fell flat. There were the stereotypical characters seen in so many other movies about dysfunctional families, however none of them portrayed interestingly enough to allow me to care about or root for them. I found the comedy to be mostly unfunny and the horror to be very un-scary. In the horror/comedy genre, when neither of those elements is effective, it's a rough slog. Perhaps if the movie had followed its comedic tendencies into more of the campy horror territory, it could have worked. But it seemed to want to take it's horror seriously and it just didn't have the horror chops to take it self as seriously as it did. I love just about everything that Toni Collette has done, but unfortunately, like the movie itself, even her performance is forgettable here.